I ♥ Athens! Here is just one reason why. 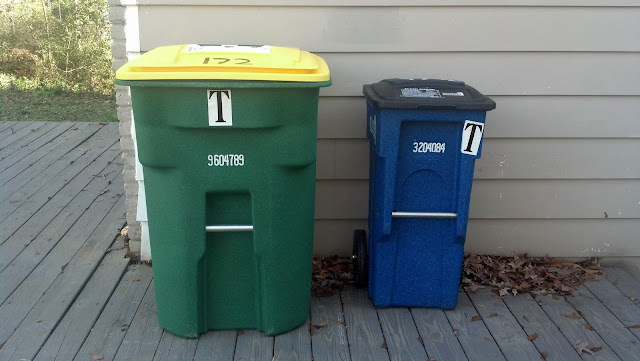 Below is a picture of our recycling bin (green on left) and our trash bin (blue on the right). Notice a difference? They have respectively 96- and 32-gallon capacities. For those of you bad at the maths, the recycling bin is three times as big as the trash bin. Even more than that, the recycling service is free. Trash pickup is a charge service with increasing fees for larger bins. It's a wonderful model in that it incentivizes socially- and evironmentally-friendly behavior; additionally, it challenges cultural assumptions about consumption and waste. I've posted on this type of policy previously (see number 8).